Our pre-admission nurses will call you 1-2 days prior to your scheduled procedure to review your medical history, medications, allergies, and previous surgeries. They will also confirm your arrival time, which may differ from the estimated time of arrival you were provided by your surgeon’s office. 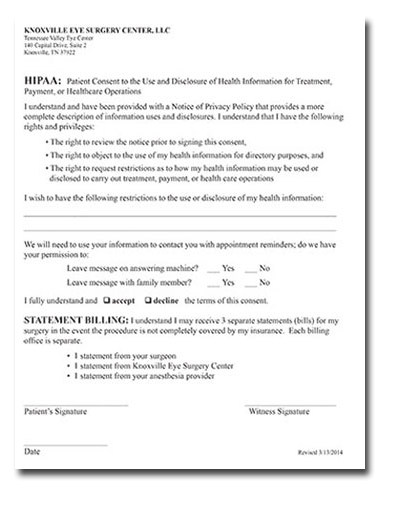 You may print and fill out these forms ahead of time. Please bring the completed forms with you on the day of your surgery. You will need a pre-admission visit within 30 days of your surgery if you have had any change in your medication or medical condition in the last 3 months. In addition, your doctor or anesthesiologist may order other tests, such as an EKG or blood test, that are essential before you have surgery. All patients who will receive general anesthesia must schedule a pre-admission visit. If your procedure requires general anesthesia or you are asked to come to TVEC for pre-admission testing, you may call for an appointment or walk in at your convenience Monday through Friday between 8:30 am and 3:00 pm. Please bring the following to your pre-admission visit: Copies of health records, medication list and dosage, allergy list, insurance information and cards. Try not to smoke before your surgery. Smoking irritates the lungs and can cause mucus build up. The less you smoke before your surgery, the better your chances to minimize congestion after your surgery. Lung congestion can contribute to the development of pneumonia. Use of tobacco is prohibited on the TVEC campus. If your surgery is scheduled before noon, do not eat or drink anything, including water, after midnight the evening before your surgery. If your surgery is scheduled for the afternoon, do not eat anything after midnight, but you may have clear liquids (water, coffee without cream, broth, popsicles) until 7:00 a.m. the morning of your surgery. The day of surgery, you should have nothing to eat, including hard candy, gum, or food of any kind. These guidelines are in place for your safety, and if you do not follow them, your surgery may be cancelled. If you are ill (i.e. sore throat, cough, fever, infections, or vomiting) you should contact your doctor’s office on the day prior to your surgery or as soon as possible. You will not be able to drive yourself home after surgery. Medications given during surgery may temporarily affect your memory or judgment for 24 hours following the surgery. Please arrange for an adult (over the age 18) to drive you home. They or a family member must stay while you are here. Other means of transportation, such as a taxicab, must be pre-approved by your doctor and the Tennessee Valley Eye Center by calling 265-251-0338. Check with your doctor regarding the medications you are taking at the time of your surgery. Your may take your blood pressure medications, heart medications, seizure medications, any breathing medications and stomach medications the morning of your surgery. You may have only enough water to swallow the medications. Do not take insulin or oral diabetic medications the morning of surgery. A legal guardian must accompany all institutionalized patients. A legal guardian must accompany all patients who are not capable of signing legal documents. 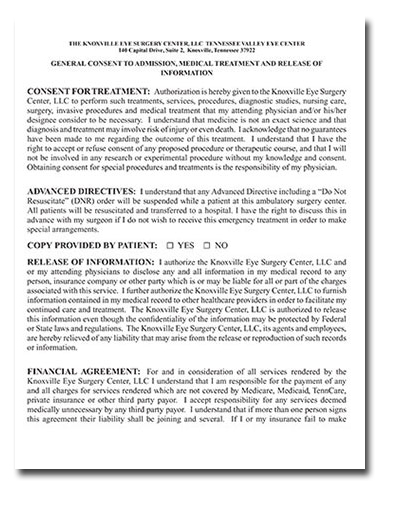 The legal guardian must bring a copy of the patient’s Living Will and Power of Attorney to the surgery center.